Vegan Heritage Press, LLC, 9781941252390, 288pp. By the author of the best-selling Vegan Richa's Indian Kitchen. In her second book, Richa Hingle applies her culinary skills to international comfort foods. She delivers a wealth of flavor-packed "awesome sauces" and mix-and-match ideas to inspire you to create stunning meal combinations. Here are chapters devoted to flavor-packed sauces, soups, sandwiches, breakfasts,sweets, and more. You will also find helpful techniques and mix-and-match ideas that will inspire creativity and provide stunning meal combinations. You will find this book to be indispensable in your kitchen, and the recipes will appeal to both vegans and non-vegans alike. 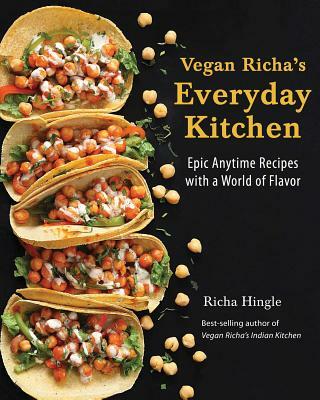 Richa Hingle is the award-winning author of the bestselling Vegan Richa’s Indian Kitchen. She is also the recipe developer and photographer behind VeganRicha.com. Richa’s work has been seen on Oprah.com, the Huffington Post, Babble, VegNews.com, Rediff.com’s “Top 30 Indian Food Blogs,” TheKitchn, MSN, BuzzFeed, and in Glamour, Cosmopolitan, and elsewhere.